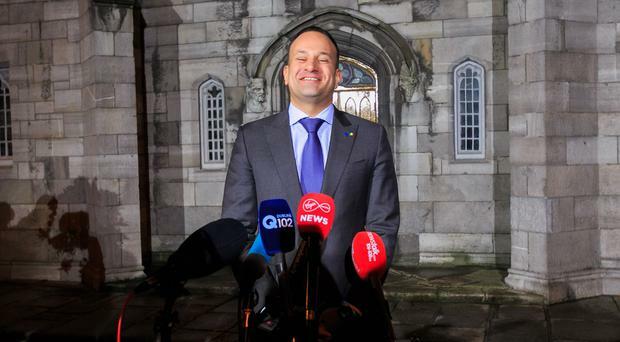 TAOISEACH Leo Varadkar has signalled that he'd like to see the seven-year term for the presidency reduced by two years. Mr Varadkar congratulated Michael D Higgins on a "historic victory" and said he got "a resounding endorsement from all sections of society". The Taoiseach was asked by reporters if there should be an election every seven years. Mr Varadkar added: "I have to say my personal view is a five-year term would be more in line with modern norms than a seven-year term." He said changing the term length would require a referendum but said: "I'm very committed to continuing to modernise our constitution to making it a 21st Century constitution for a 21st Century republic". He did say that there are other issues on the agenda as well including votes to allow for directly elected mayors and the issue of women in the home in the Constitution. He added that there shouldn't be too many referendums on the one day. Mr Varadkar also said the government would give consideration to extending the Freedom of Information Act to the presidency. John Downing and Rachel Farrell Fianna Fáil's leadership has been accused of "closing the door too early" on the prospect of party membership for presidential runner-up Peter Casey. Rachel Farrell Presidential runner-up Peter Casey has clarified his intentions to join Fianna Fáil - and said that if they don't accept him, he'll set up his own version of the party instead.